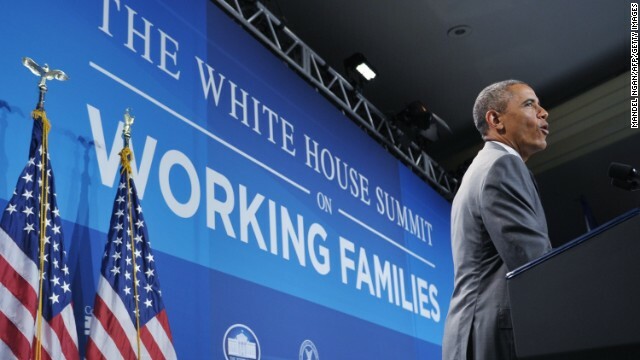 Washington (CNN) – President Barack Obama talked about his own family's struggle to balance work and family life at Monday's White House Summit on Working Families, calling on Congress to act to make finding that balance easier. “Before I moved into the White House, I was away a lot, sometimes with work, sometimes with campaigning. Michelle was working full-time and was at home with the responsibility all too often of dealing with everything that the girls needed,” the President said. The President said that expanding flexibility in the workplace and having paid parental leave would help America compete on the world stage, noting that the United States is the only developed country to not offer paid maternity leave. “When a new baby arrives or an aging parent gets sick, workers have to make painful decisions about whether they can afford to be there when their families need them the most. Many women can’t even get a paid day off to give birth. Now, that’s a pretty low bar,” Obama said. He recalled being a father of a newborn with late-night feedings and the importance of being able to be with his daughters immediately after their births. “I was lucky enough to be able to take some time off so that I was there for the 2:00 a.m. feeding and the soothing, and just getting to know them and making sure they knew me. And that bond is irreplaceable. And I want every father and every child to have that opportunity,” he said. He urged the passage of the Pregnant Workers Fairness Act, which would require employers to make accommodations for pregnant workers to be able to keep working while pregnant and prevent them from having to take unpaid leave. He also used the speech to encourage companies to give better access to high-quality childcare and he repeated his call to raise the minimum wage to $10.10 an hour. He argued that these are not solely women’s issues because they impact the entire family. During his remarks, the President announced he would be signing a Presidential memorandum for federal agencies to expand access to flexibility for work schedules available for all employees. The summit, held Monday at a Washington hotel, featured first lady Michelle Obama, Vice President Joe Biden and his wife, Dr. Jill Biden, senior adviser Valerie Jarrett, Secretary of Labor Thomas Perez, as well as business leaders and educators. Prior to his speech, Obama made an unannounced stop for lunch at a local Chipotle with four participants in the summit who shared with him their struggles with the balance between their careers and families. Filed under: 2014 • President Obama • Washington D.C.
Poor Mouthing us are you Obama? So tell us, if you can, how did you get the bread to go to Harvard??? In fact why did you even want to go to Harvard?? Remember folks, if you like your Nanny you can keep your Nanny. Smith – @Wake Up-My point is having kids when you can`t afford them equals that person having a very hard life. If that is something they wants then fine but they should be resposible, not cry and moan and expect others to pay their way. Btw, this is a colorblind issue that affects all races. Hey, you want to live in a world where everybody is so selfish as you are, fine by me. But why would children have to be penalized for their parentes have not been as 'responsible' as you want that all be? Let's hope the working people of this country remember which party is working for THEM and which party is working for the Koch brothers!!! What possible time could he be spending with his family. "The President said that expanding flexibility in the workplace and having paid parental leave would help America compete on the world stage, noting that the United States is the only developed country to not offer paid maternity leave." We are the only developed country who does not require photo ID to vote, also. Why aren't you working to change that, Barack? thing and provide something else.